Eliminates mineral deposits without stripping sealants. Non-abrasive gentle chemical cleaning action. Effective on paint, clear coats, and glass. Duragloss Water Sport Remover is a unique formula that removes the calcium and magnesium found in most water spots while keeping waxes and sealants in tact. If these water spots are not removed, the mineral deposits can damage paint and glass. 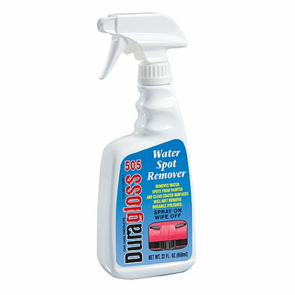 Duragloss Water Sport Remover will not remove water etching but helps prevent them from occurring.